Built by Agustín Sanz. Opened 25 Aug 1799. 1858 rebuilding by José de Yarza. 1890 rebuilding by Ricardo Magdalena. 1940 rebuilding and facade alteration by Regino Borobio Ojeda. 1986 rebuilding by José Manuel Pérez Latorre. 1100 seats. 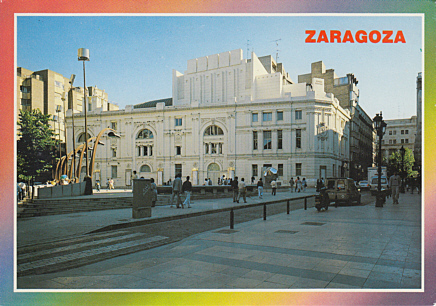 Front Text: "Zaragoza - El Coso - Teatro Principal"
Reverse Text: "Zaragoza. Plaza de Don José Sinues. Teatro Principal." 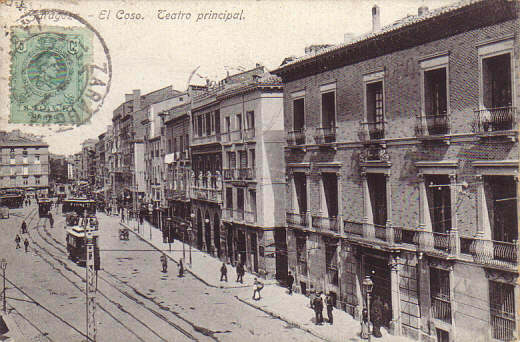 Thanks to Raul Sensato for his blog article pointing out which building is actually the theatre on the 1922 postcard.